Better face the facts. It’s highly unlikely you’re going to retire at your current place of employment. This means your current day job is temporary. Some employees hear this and “go ostrich.” Fearfully, they stick their heads in the ground and ignore this truth. Other employees wake up to the fact it’s their responsibility to create a side hustle now, before their jobs are eliminated or outsourced. Coaching is one the fastest growing professions. It’s a multi-billion dollar industry producing incredible benefits for the coach and client. You can work whenever from wherever, with just a laptop or phone. Convert your knowledge and experience into true value for others. Co-create visible results in the lives of others. Get paid to do what you love while invest in clients from around the world. A Truth Teller pushing you to dream bigger and dig deeper. Regular accountability for personal and professional goal achievement. Wisdom and insight from someone not directly tied to the outcome. A confidential relationship that leads to more clarity and confidence. 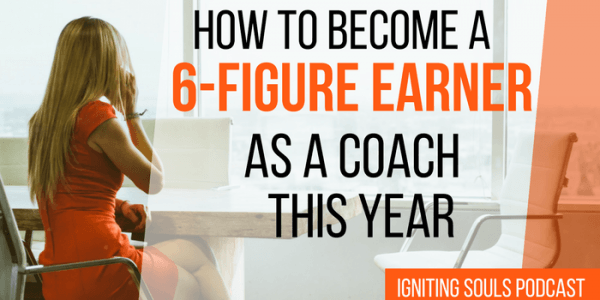 In today’s podcast I share how to become a 6-Figure Earner as a Coach this Year. (Listen to this episode via itunes, audioboom, or stitcher). A few times per year we receive applications from quality candidates who have an interest in joining the Igniting Souls Team. If you’re interested in applying please click on the respective link below. And if you’d like to apply for all 3 simply fill out an application for one and we will consider you for all three. I help authors, coaches and speakers launch 6-figure businesses by crafting their message and mastering their marketing. 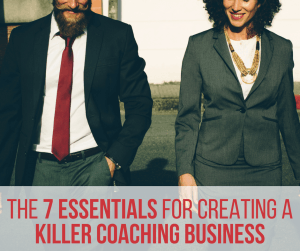 Join me in this exclusive Master Class where I show you the 7 Essential Elements for Creating a Killer Coaching Business. Coaching is one the fastest growing professions. It’s a multi-billion dollar industry producing incredible benefits for the coach and client. Please consider rating the podcast with 5 stars and also leaving a one- or two-sentence review in iTunes or on Stitcher. This helps tremendously in bringing the podcast to the attention of others. I am also mentioning the names of all who rate the podcast with 5 stars in future episodes. We encourage you to join the Igniting Souls Tribe on Facebook. It’s a community of like-minded influencers as well as listeners of the Igniting Souls Podcast. Furthermore, you can tell your friends on Twitter about the podcast by simply clicking this link and sharing the tweet you’ll find at the other end. I am an author, coach and speaker who helps individuals and organizations clarify who they are, why they're here, and where they're going so they can become a Soul on Fire, experience Unhackability, and share their message with the world.